Are Dallas collectors the honey badgers of the art world? Dealers at the ninth annual Dallas Art Fair seem to think so. “If they see something they like and they can afford it, they buy it,” said Wendi Norris, founder of the seven-year-old Gallery Wendi Norris in San Francisco. Honey badger don’t care. “There’s a deeper authenticity in what they like and what they’re collecting,” Norris added, a quality she says makes her work more rewarding and drew her back to Dallas for her third year in a row. She sold both of the large-scale Eva Schlegel photographs she brought for $26,000 and $22,000, to two prominent local collectors, both of whom were new to the gallery. Dallas has always been an original, iconic city, once known for its big money and big hair. At the art fair, you’re more likely to hear about the locals’ big hearts, big homes, and big personalities. That’s not to say the money isn’t there—the city revolves around philanthropy, powered by money old and new. The social calendar is packed with galas, many of them hosted by the city’s prominent arts patrons. 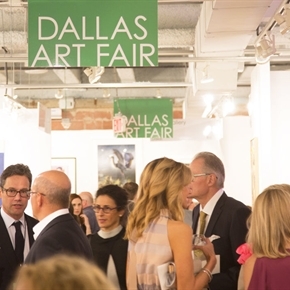 Several dealers traced their decision to attend the fair back to their artists’ success at Two x Two, the October fundraiser organized by collectors Howard and Cindy Rachofsky, whose proceeds from the auction of donated art benefit amfAR and the Dallas Museum of Art(DMA). Three major collectors, the aforementioned Rachofskys, Deedie Rose, and Marguerite Hoffman, have all pledged their collections to the DMA, and other local collectors sit on boards of other major arts institutions, such as the Nasher Sculpture Center and the Dallas Contemporary, a non-collecting institution in the city’s growing Design District. And their ranks are growing, both in Dallas itself and in Texas’s other major cities, despite the oil price slump of the past few years. Austin, a few hours’ drive away, is a burgeoning tech hub. The Dallas-Plano-Irving metropolitan division saw employment grow 3.7% over the year through February, the largest percentage increase in the nation, with 91,500 jobs added in that 12-month period. Nearly a fourth of those were in the professional and business services field, according to the Texas Workforce Commission. The Dallas-Fort Worth-Arlington metropolitan statistical area’s GDP clocked in north of $485 billion in 2015, according to the Commerce Department, making its economy slightly larger than Poland’s. “Culture follows commerce,” said John Sughrue, a genial real estate investor and developer who co-founded Dallas Art Fair with Chris Byrne, in the two-story Fashion Industry Gallery developed by Sughrue’s firm. The fair, now up to around 95 galleries, about 40% of them international, unfolded over four days in downtown Dallas’s Arts District, a few blocks from the Nasher, the DMA, new condo developments, several high-end hotels, and a glittering outpost of the city’s renowned clothing boutique Forty Five Ten. Sughrue estimated that 50% of new home developments were being built in modern styles, positioning the city for ever more consumption of contemporary art. And the city sprawls, offering space for collections to grow into locals’ Texas-sized homes and inexpensive warehouse capacity. Tammy Cotton Hartnett, a local collector and board member of Dallas Contemporary, said many collectors here have multiple storage spaces, “which allows them to purchase more.” Several of the city’s prominent private collections, such as that of the Karpidas and Rachofsky families, are housed in large hangar-like spaces where they can be visited by appointment. Hartnett noted the city also attracts wealthy residents from overseas—“from Paris, from Mexico City—anyplace with [economic] volatility,” she said, thanks to Texas’s lack of an income tax. And unlike honey badgers (who are apparently actually kind of nasty), Dallas collectors are a warm and collaborative bunch, ginning up support for the arts amongst their friends and peers, and sharing tips on artists and galleries they like. The fair itself has been one way for collectors to band together and support the arts. Gowri and Alex Sharma, two art lovers and supporters of the Dallas Art Fair Foundation Acquisition Program, helped bring new members to the fund and double the acquisition budget this year to $100,000, through the donations of 10 individuals or couples, and a matching grant raised through the fair’s opening night gala. The Sharmas jokingly call themselves “ambassadors” for the acquisition fund, happy to talk to anyone about what it has purchased and why, in order to generate critical dialogue among the city’s professional class. The acquisitions—seven pieces by six artists—were announced Thursday morning, and included an acrylic and mesh piece, Bread Winners (2017), by Summer Wheat of Fridman Gallery in New York, two paintings by Derek Fordjour, No. 73 (2017) and What will you do to help us Win? (2017), from Turin’s Luce Gallery, and a sculpture, Levelland (2017), by Justin Adian of New York and London’s Skarstedt. “We’re all people who can buy art, good art, and we can share that passion,” said Alex, who sees the cultivation of a substantial pipeline of up-and-coming collectors as critical to making Dallas’s art scene sustainable. The fair plays an important role in helping develop that subset of collectors, both by bringing them in for a gander (many of the works have relatively accessible prices, with paintings and sculptures starting in the low four figures), and through the multiple satellite events that happen over the week and the entire month of April. John Runyon, one of Dallas’s leading art advisers, said the strength of the city’s art scene was its continuity—between different generations of collectors, its galleries and the fair, the institutions, and even commercial venues such as Forty Five Ten, where he’d curated a Juergen Teller exhibit during the fair, or the Dallas Cowboys stadium, which features more than 20 works of contemporary art from the likes of Jenny Holzer and Doug Aitken. He’s a key part of that network too, helping recruit international and top-tier galleries to the fair, noting that some of his younger clients may not have the ability to travel as much as those who make the art fair circuit part of their lifestyle. Frank Elbaz, the founder of the eponymous gallery in Paris, said the presence of what he calls “middle-class collectors,”—the doctors, lawyers, and other well-paid professionals who enjoy art, visit galleries and collect works in the mid-five figure range—combined with the fair and its proximity to Houston and Austin, made the city an extremely attractive place for his first U.S. outpost. Elbaz bypassed New York and Los Angeles (“I don’t see the point of adding one more gallery to the long list,” he said) and opened a space just across from Dallas Contemporary, where he hosted the opening of the group show Paris Texas on Friday night, featuring works by Francis Alÿs, Julie Cook, Robert Rauschenberg and Blair Thurman. Many other fair exhibitors cited the fair’s leisurely pace, and the meaningful interaction it allows, as a huge plus. Anna Stothart of Lehmann Maupin, a former curator herself, said she had been able to meet with Jed Morse from the Nasher, Alison Hearst from the Modern Art Museum of Fort Worth, and Suzanne Weaver the San Antonio Museum of Art. And in the meantime, the gallery sold well: a neon sculpture by Tracey Emin, a Catherine Opie football landscape, Pettitoe, Suffolk (2011) by Juergen Teller, and Teller’s large-scale photograph of Joan Didion that’s been used as an advertisement for the fashion house Céline. He said he had found it easy to plug into Dallas. “People end up bringing their friends, and the circle keeps on expanding,” he said, noting also the institutional support from museums and their boards, and the added of meeting Houston collectors too. He said two clients he’d met last year in Dallas had visited the gallery in New York, and had since bought from him. This year he placed paintings by Matthew Fisher, Austin Eddy, and Ryan Schneider, all with private collectors, a mix of new and old clients. The works in his booth ranged from around $800 to $15,000 for larger paintings by Yui Kugimiya, who is in the Museum of Modern Art’s collection. Kourosh Nouri of Dubai’s Carbon 12 Gallery is another dealer who heard about the fair from gallery friends, but the draw was also obvious: “It’s the size of a European country.” He said Dallas collectors were also distinct in spreading the word to their friends about new artists they’ve found; he contrasted that to an attitude common in Europe, where collectors may closely guard artists they’ve “discovered.” Nouri placed works by the majority of his artists at the booth, among them Archer Kogl (2017) by Philip Mueller, Fragile (2015), a bronze sculpture by Sara Rahbar, three oil on Plexiglas paintings by Gil Heitor Cortesão, ranging in price from €10,000 to €40,000, and a colorful large-scale painting, Untitled (2017), by Bernhard Buhmann. Harlan Levey, a native Clevelander whose gallery, Harlan Levey Projects, is based in Brussels, described the city’s collectors as eager to learn. He brought one of the fair’s more conceptual booths, with a video work by Emmanuel Van der Auwera that sold for $17,000, two works by Polish artist Marcin Dudek that went for $6,500 and $12,500 (full disclosure: the smaller piece went to my cousin, a pathologist in Austin and an arts enthusiast who was visiting Dallas Art Fair for the first time), and a TR Ericsson for $25,000, among other sales, making it his best art fair ever, business-wise. The city’s sculpture tradition was one reason Anat Ebgi’s booth featured a selection of totemic works by An Te Liu. Director Stefano di Paola said the Los Angeles gallery was back in Dallas and focusing again on regional American fairs, after a period of doing mostly European fairs and cultivating relationships there. “People loved the work and we made great sales,” di Paola said, pointing to several works by Liu, including Tropos I/I/II (for Djuna Barnes), (2016) for upwards of $30,000 and two works from Liu’s Eidolon series for around $7,000 to $8,500, all to local collectors. “And they say sculpture’s hard to sell.…Not when it’s good!” he joked. Di Paola greeted Dallas collectors Dianne and Mark LaRoe, who quickly dove into the gallery’s iPad offerings and settled on a large pink and red canvas and thread woven work by Ethan Cook that was not in the booth. Before they sealed the deal, Mark took a step back and looked at the Cook canvases on the wall, and did what he said is his regular background check on an artist.